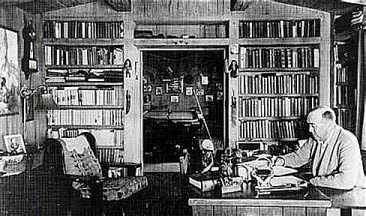 Author Edgar Rice Burroughs, the creator of Tarzan, and Malibu's first honorary mayor, works at his desk in his La Costa Beach study in this photo c. 1934. All photos in this article are from the official Edgar Rice Burroughs website, tarzan.org, unless otherwise noted, and are used with permission. In 1991 the City of Malibu incorporated and Walt Keller, the recipient of the highest number of votes in the newly created municipality’s first city council election, was named Mayor of Malibu, but he wasn’t the first person to receive the title. That honor goes to Tarzan creator Edgar Rice Burroughs, who was named unofficial Mayor of Malibu by his neighbors on La Costa Beach in 1932. Burroughs was a literary phenomenon. He wrote dozens of bestselling pulp fiction stories set in exotic locales and filled with noble savages, aristocratic heroes, damsels in distress and despicable villains. 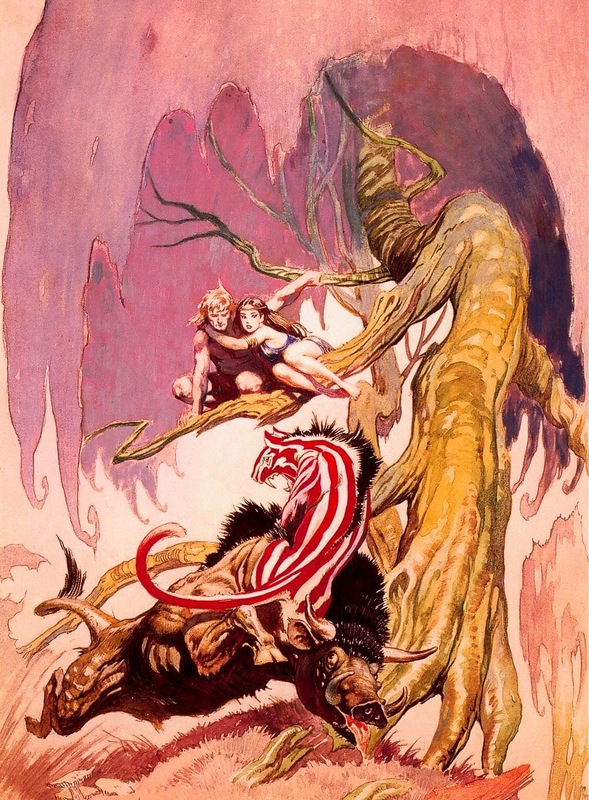 His output included 25 Tarzan novels and 10 set on Mars, in addition to stories about a hidden world full of prehistoric wonders at the center of the earth, travels to Venus—which the science of the era envisioned as a jungle planet, westerns, historical romances and a series of contemporary adventures involving an alcoholic prizefighter. Tarzan first appeared in 1912 in the pages of All Story Magazine. By 1914, the story was a best-selling novel. The image on the left is Tarzan's first ever appearance, the cover on the right is from the first Canadian edition of the novel, published in 1914. Both images are from Wikipedia. Tarzan and John Carter of Mars, Burroughs’ best known fictional creations, both celebrated their 100th anniversary in 2012. Unfortunately, John Carter, the Civil War captain who finds himself mysteriously transported to the red planet, tanked on the big screen in director Andrew Stanton’s $350+ million film “John Carter,” produced by Walt Disney Pictures in 2012. Delaware artist Frank Schoonover's evocative art nouveau cover for the 1917 first edition of A Princess of Mars sets the tone for the reader. Like Tarzan, the first Mars adventure‚ originally entitled Under the Moons of Mars. debuted in The All Story in 1912. Credited as the original space opera and the inspiration for everything from Flash Gordon to Star Wars, this work is reportedly the first novel Burroughs' prepared for publication. 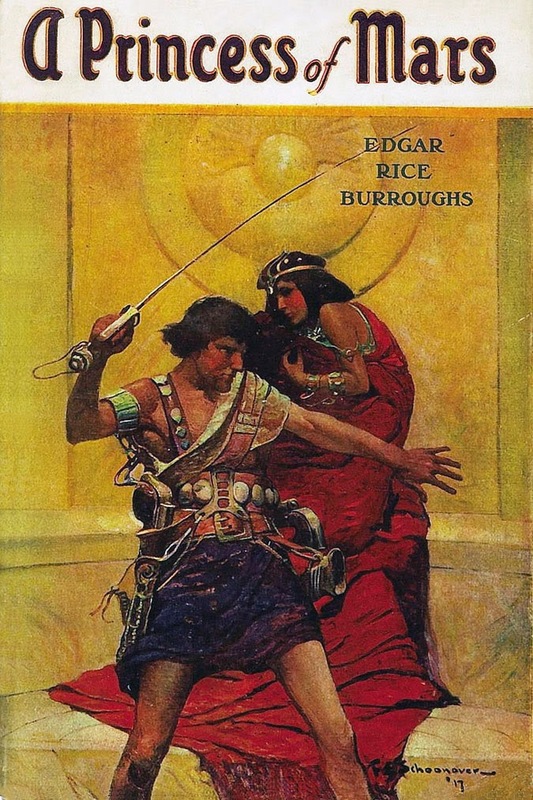 A Princess of Mars was written in 1911, although it wasn't published in book form until 1917, three years after the first Tarzan novel was published. Image: Wikipedia. However, Burroughs’ other major creation has been a multimedia moneymaking powerhouse for over a hundred years. The Internet Movie Database lists an astonishing 89 film versions of Tarzan’s adventures, ranging from a 1918 silent series starring Elmo Lincoln, to a film directed by David Yates scheduled to be released in 2016 and starring Swedish-born actor Alexander Skarsgard in the title role. Tarzan has also had a long and successful career as a comic book character, the star of numerous TV shows, radio programs and cartoons, and has earned a place as a globally recognized cultural icon. Burroughs was born on Sept. 1, 1875, in Chicago. In 1900, he married Emma Hulbert. The couple had three children. The family lived in Oak Park, Illinois, during the period when Burroughs' career as a writer began. 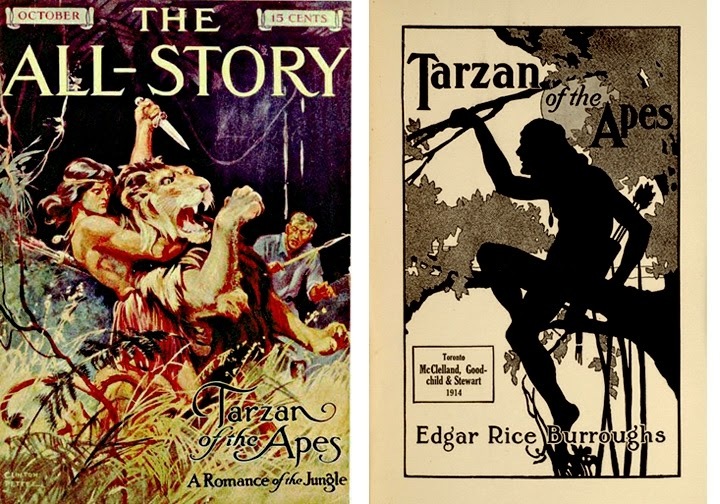 Tarzan the Ape Man, written in Burroughs' spare time, was published in serial form in 1912, swiftly followed by A Princess of Mars, the same year. By 1919 Burroughs was a successful author, and he and Emma and their three children were established on a ranch in a part of the San Fernando Valley that would come to be known as Tarzana in Burroughs’ honor. Edgar Rice Burroughs' La Costa Beach property, photographed by an itinerant photographer in the mid 1930s. According to the Los Angeles Evening Herald, Burroughs purchased a seven-room Mediterranean-style house with 40 feet of ocean frontage in August of 1931 for $25,000. It was one of the earliest houses on La Costa Beach. May Rindge, the last owner of the Topanga Malibu Sequit Rancho, sold La Costa Beach in 1926 for $6 million to real estate developer Harold Ferguson to help defray the cost of litigation over government plans to open the rancho to public access. Ferguson planned the La Costa Beach Club, development streets and parcels, built a bunch of fake Spanish mission ruins to add a bit of Ye Olde California atmosphere, and began selling lots. La Costa Beach in 1939. 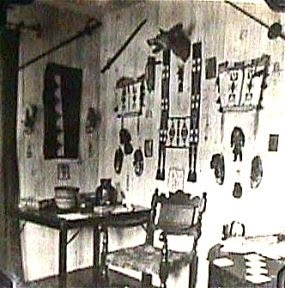 Burroughs' property is visible in the right corner. This image is from a real estate brochure in the Malibu Historical Photograph Collection at the Pepperdine Library. Today, La Costa Beach is part of the Great Wall of Malibu—wall-to-wall beach houses that almost entirely block the public's view of the ocean from the highway, but when Burroughs moved to Malibu there were only a few houses and a nearly 360-degree vista of unspoiled beach and mountains. The 1930s were a prolific decade for Burroughs. 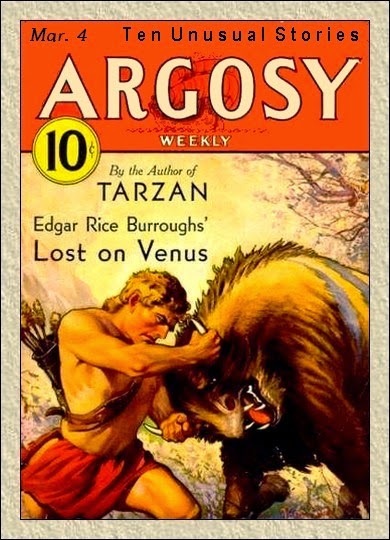 ERBzine, “the official Edgar Rice Burroughs Tribute Webzine” lists fifteen titles that were published during the period when Burroughs was active in Malibu, including, Tarzan and the City of Gold, 1931; Pirates of Venus, 1931; Tarzan and the Lion Man, 1933; Swords of Mars, 1933; Tarzan’s Quest, 1934; Tarzan the Magnificent, 1935; and Back to the Stone Age, 1935. Lost on Venus, published as a serial in 1933, was reportedly written in Malibu. The original cover art by Paul Stahr—and the entire story—can be found at Project Gutenberg Australia. Here's illustrator Frank Frazetta's vision of some of those "unimaginable perils" from a much later edition of Lost on Venus, published by Ace. In 1932, MGM released the first Tarzan "talkie," Tarzan the Ape Man, starring Johnny Weissmuller and Maureen O’Hara. The film, directed by Woodbridge Strong Van Dyke—had a big budget—$1 million. The film was a huge success, spawning numerous sequels. 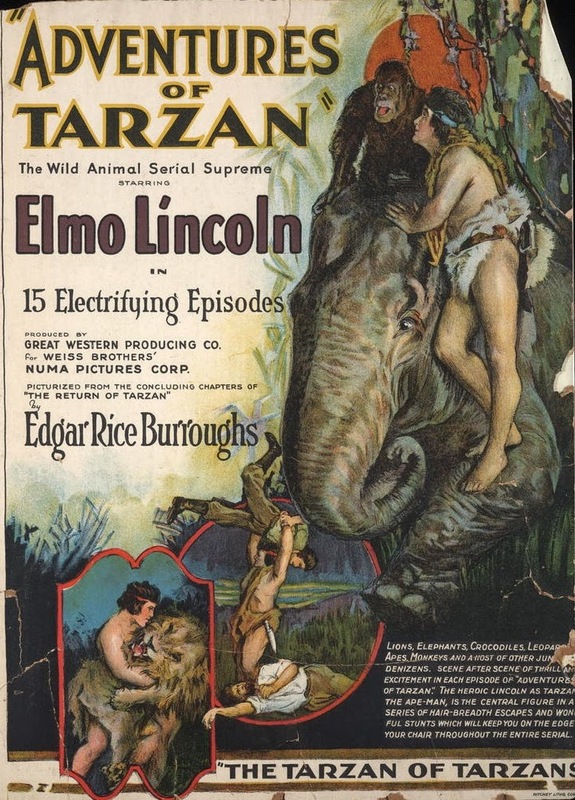 And while Burroughs appears not to have liked MGM's interpretation of Tarzan, he was a savvy entrepreneur in addition to being a prolific and imaginative writer, and successfully fought to hold onto the rights to his intellectual property. In September of 1932, the Tarzana house was listed for sale, and Burroughs announced that he planned to move permanently to Malibu. 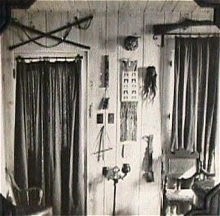 Archival photos from the ERB website show the interior of the original La Costa beach house. 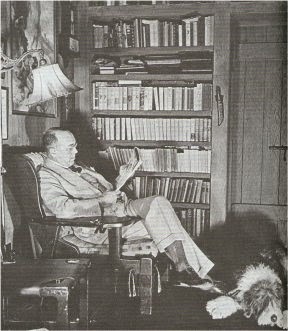 Burroughs relaxes in his Malibu study with his much-loved sheep dog at his feet. I was delighted to find this photo because I was told years ago by a former longtime La Costa resident that the author was remembered as an energetic and genial man who loved the beach and walked and swam in all weathers, often accompanied by an enormous old English sheepdog, who was the bane of the Burroughs’ family housekeeper, owing to a coat of hair that could transport half the beach’s sand into the house. 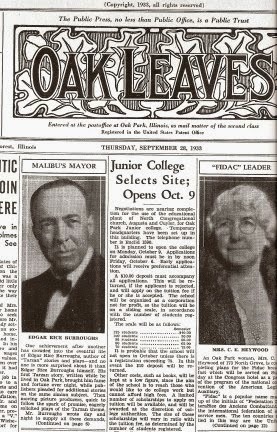 A clipping from the September 26, 1933, issue of Oak Leaves from the archive at tarzan.org. The title of mayor was purely unofficial and the duties appear to have consisted entirely of presiding over beach parties. Burroughs reportedly threw himself into seaside living with enthusiasm. An article in the March 1938 issue of Fortune Magazine states: "Mr. Burroughs lives at Malibu among film people. Here he does much of his writing, rides horseback, plays tennis, and indulges in private flying, which he took up at the age of fifty-eight." Ed and dinner guests are sitting in the Malibu residence study waiting for dinner when a major earthquake strikes just before 6 p.m. (The serious Long Beach Earthquake). Severe shaking and a ceiling that appears to move in circles send them out to Roosevelt Highway. The cook/server is most upset at the meal being ruined, having his table setting messed up and having to turn off the gas. Despite continual aftershocks they manage to have dinner at 10 p.m. [Burroughs] counts at least 35 aftershocks over the next few days. Ed found the first shock to be rather thrilling but he finds the long string of aftershocks to be very hard to adjust to. 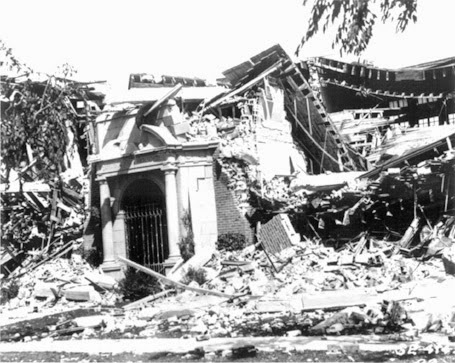 An archival photo from the USGS earthquake site of damage caused by the 6.4 1933 Long Beach Earthquake. This was Jefferson Junior High School in Long Beach. Burroughs' wrote the only known account of the earthquake in Malibu. Burroughs divorced his wife in 1934, married actress Florence Gilbert Dearholt in 1935, and moved to Hawaii in 1940. The marriage didn't last, but Burroughs remained in Hawaii. He was in Honolulu during the Pearl Harbor attack. He received permission to become a war correspondent, despite being in his late 60s, and spent the war years in the Pacific. It’s unclear when Burroughs sold the La Costa property, but he returned to Tarzana after the war. ERB Inc., incorporated by Burroughs in 1926, still maintains an office on a small corner of what was once Burroughs’ 200-acre ranch. One of Burroughs' two La Costa houses was bought by Elmer and Peggy Callen in the 1960s, and Peggy, a passionate advocate for environmental issues and a champion of Malibu cityhood, came within inches of being elected Malibu's first official mayor in 1976, during the community's second bid for incorporation. The measure lost by just 108 votes. The house is still there. It's been remodeled, but it hasn't yet been replaced by a mega-mansion like many of its neighbors. Here is Burroughs' stretch of La Costa Beach as it appears today in Google Street View. Burroughs died in 1950. He is regarded today as one of the 20th century’s most successful authors, and his most popular works have remained continuously in print. It seems appropriate that the honorary title of first mayor of Malibu goes to a legendary writer, one who forged his own enduring mythology. 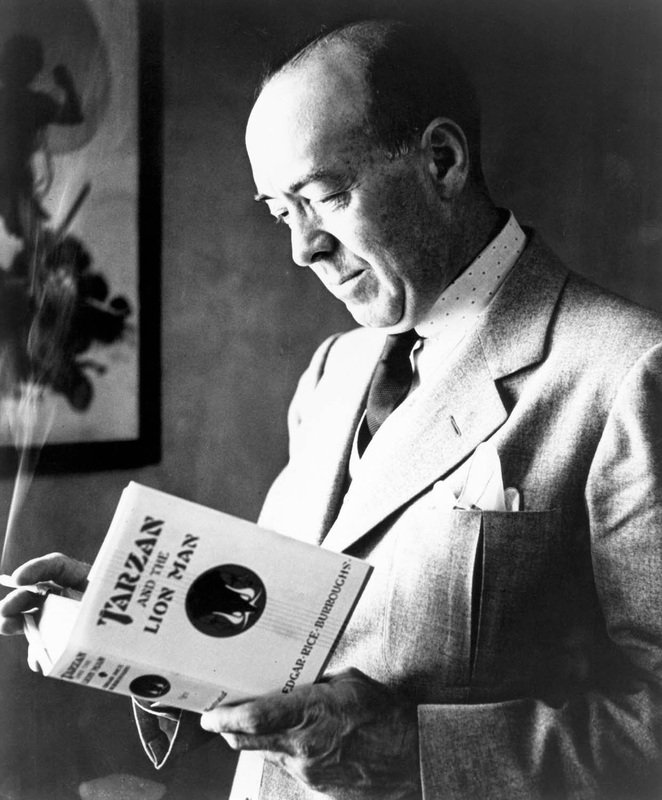 Edgar Rice Burroughs examines a copy of Tarzan and the Lion Man in yet another image from the wonderful collection of Burroughs family photographs at Tarzan.org. 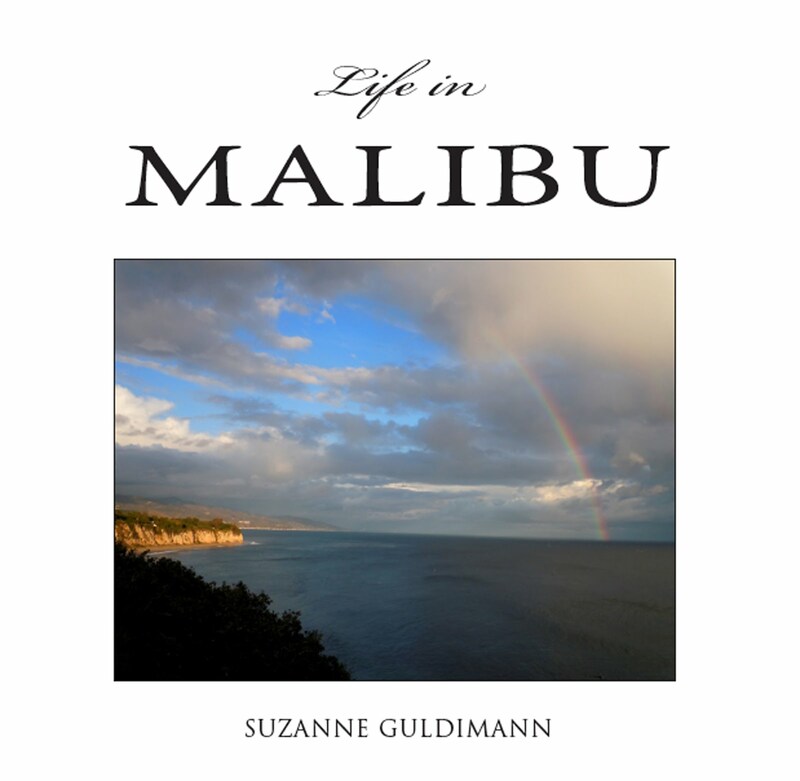 The book was one of titles published during the years that Burroughs owned his La Costa Beach home. The quote at the beginning of this article is from author Edgar Rice Burroughs’ best known book, Tarzan of the Apes, but the sentiment was one Burroughs appears to have shared with his creation. In Malibu, for a little while, at least, he had all of those things. 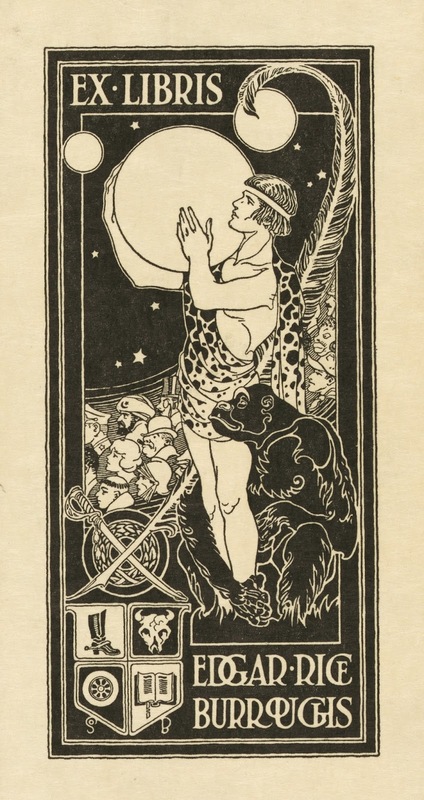 Edgar Rice Burroughs bookplate, preserved in the Library of Congress.